My sisters were just asking for ideas about what to put in a moist, shady garden, which prompted this post. If you have such a place in your yard and are at a loss for what to put in, here are some ideas. I've found these plants have done well in the cool, maritime climate and acidic soil of Western Washington. At the end of this post are photos of a few of these plants from my gardens. Update: Yesterday I got some photos of shade plants at the Arboretum exhibit, "Bird Song" at the 2012 Flower and Garden Show. You'll find them at the end of this post. Tips: Put the tallest plants in the back of the garden, and work forward according to size. Mix the plants with spiky flowers in with the bushier plants. Pacific Northwest natives are starred. * Natives are good because they require less care and support local wildlife. If you can't find them at a mainstream nursery, look for a native plant nursery either locally or online. See also the Washington Native Plant Society page. Do not plant variegated ground elder. It will take over your entire garden and yard. Bill calls it a bio hazard. Tree fern * (grows to be tree-like.) - 6 ft or more. Wood fern * Not as sturdy as a tree fern. Dies down to the ground in winter and comes back in spring. In the center foreground is a Yak rhododendron aptly named "Mardi Gras" because it will have gaudy pink, white, and purple blooms in late spring. Volunteer iris is growing up between its leaves. To the left is the newly planted hosta and some more iris. To the right is a Crocosmia, which I call the "hummingbird" plant because the hummers love it. In summer it has 5-foot long spikes covered with small, bright orange flowers. Camelia can grow 20 or 30 feet tall, although there are varieties that stay much smaller. They come in a variety of pink and red colors. Hydrangea. To make next year's flowers pink, add lime to the soil. For blue, leave the soil acid. For in between, like these, go halfway with the lime. Common floxglove stands tall against the fence. To the left in back is the tall iris foliage (will have yellow blooms). In front you can see a small vine maple that we'd recently planted. It's the one with reddish tinge on the leaves. It will grow up to 20 or so feet tall. To the right is some sort of crabapple tree with draping branches. Fancy foxglove I got at the nursery. 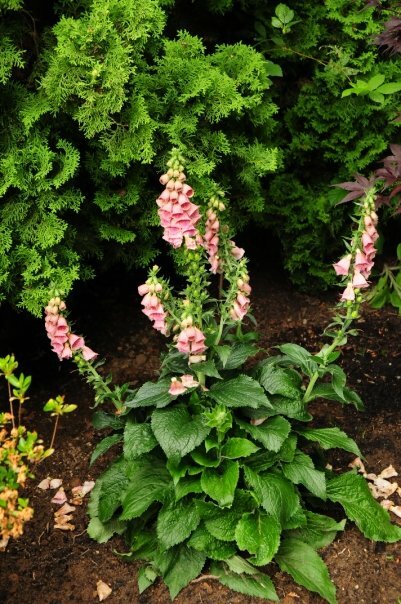 I call it the Beatrix Potter foxglove because it looks like the ones pictured in her books. 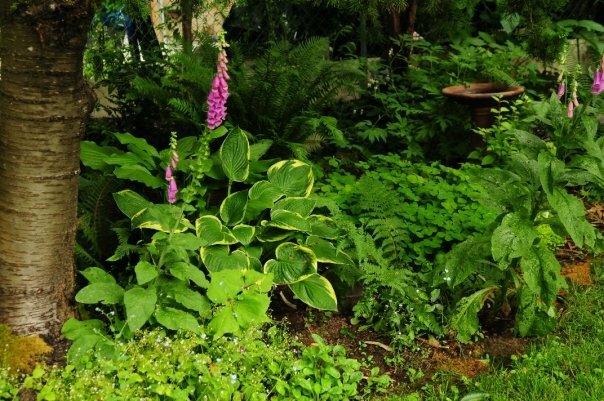 Variegated and plain hosta, center, sword fern, back left, in front of the fern is native iris and in front of that is English primrose. To the right of the primrose is Irish moss, then another foxglove. Behind the foxglove is oxalis. In the far back is a Fortunei rhododendron. Native violet in foreground. 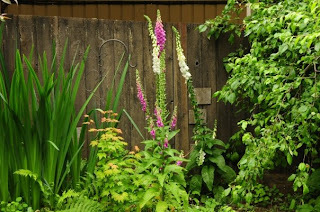 Behind it is foxglove and then hosta. Further back is a large sword fern. 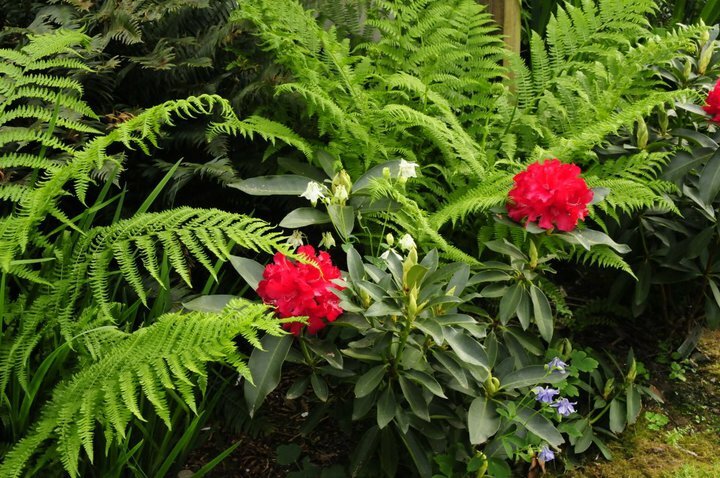 To the right of the sword fern is bleeding heart. More oxalis in front of that and then another foxglove. Lady ferns surround a Jean Marie De Montague rhododendron. Columbine grows under the rhodie and sends spikes of blue and white flowers up in between the rhodie's leaves. 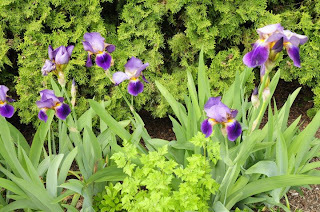 Iris fronted by feverfew (not a good shade plant, BTW). This iris grows to about 2 feet with flowers another foot taller. 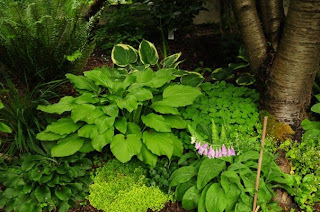 I took the following photos of shade tolerant (or loving) plants at the Arboretum "Bird Song" display garden at the 2012 Seattle Flower and Garden Show. Most are Northwest natives. Left front: Mahonia (Oregon Grape). Front left: Red twig dogwood. Middle left: Ninebark and then Camelia. In front of the Paperbark Maple is sword fern. To the left, Camelia and right with yellow flowers is a Witch Hazel variety. Red twig dogwood, again. I don't know what the yellow bush is. Here's a richly flowered Oregon Grape variety, called Mahonia aquifolium "Orange Flame." I need one of these! Ninebark in the background and Bunchberry in the foreground. You can find some more plant ideas in Shady Characters, an article by Valerie Easton, published in Pacific Northwest. Planting a New Pacific Northwest Shade Garden - We moved to Seattle and planted a new shade garden in our city yard. How to Plan a Garden - Some basics you might want to consider. Gardening for Wildlife - Find out how to create a backyard wildlife habitat. Rain Gardening for Orcas - Rain gardens help keep raw sewage out of Puget Sound. An Excursion to the Flower and Garden Show - More photos of the 2012 show in Seattle. Planting a Native Australian Shade Garden in Sydney - Liz replaces non-natives with natives in her Sydney garden. A plant list for temperate, moist, shady locations. Thanks! I love this post on shady gardening in the NW, and also the great photos with identification. Thanks for helping remembering. I moved away for 6 years and miss my Portland garden. Now i'm in Washington and can't wait to start again. I also found the Pacific NW garden guide.